I picked up the Snapware’s 4 Liter Airtight 17 Cup Airtight Container by Snapware primarily to use for DME storage. I think it would also work well to store specialty grain, other ingredients or for use as general storage around your brewery. This container is part of the Snapware MODS Rectangles series. It is 100-Percent airtight and 100-percent water tight. It features easy to open and close latches that work together with the silicone seal to keep foods fresh and to prevent liquids from leaking. Click for a larger photo. This container is made in the USA, Dishwasher Safe, Microwave Safe, Freezer Safe, Airtight, Leakproof, Stackable and BPA free. It has a capacity of 17 cups or 4 liters. The label easily peels off to reveal care and use directions. No residue. This is a pet peeve of mine. Why do manufacturers make labels that don’t come off easily? It’s not like we don’t have the technology! We’ve put a man on the moon! Or have we?? This holds right at 5 lbs of this particular grain. 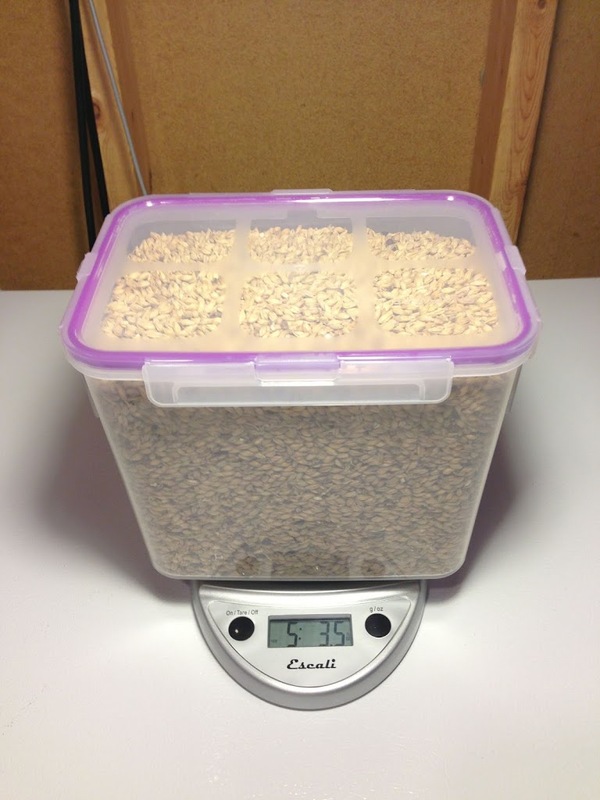 The weight of the container itself is excluded from this reading because I used the tare feature on my Escali Primo Scale. 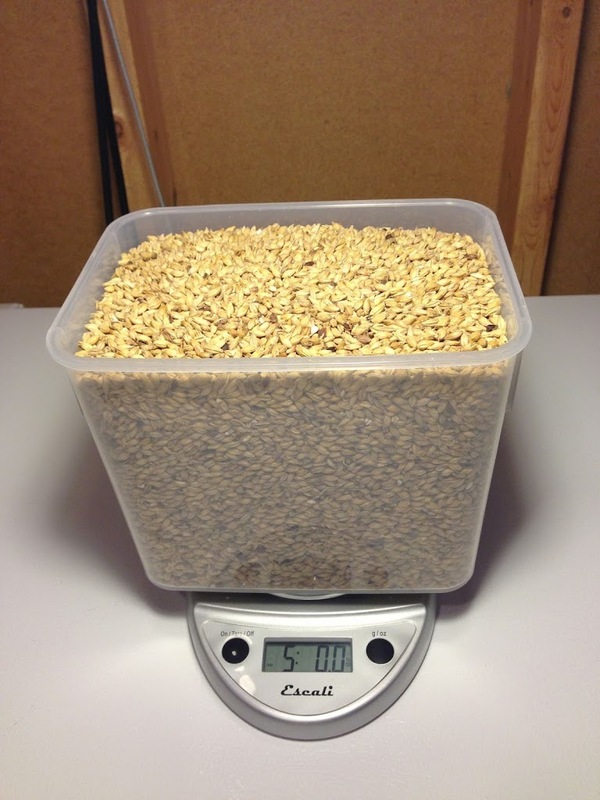 This is going to define a new rule of thumb for me when evaluating containers with a known volume for grain storage. 1.25 lbs/liter. You can see that the lid easily closes with 5 lbs of grain in the container. I think this is a good size for storing specialty grains. Obviously, this isn’t going to be dandy for storing a sack of base grain. You’re probably not going to want to buy 10 of these containers. Here’s the container holding 3 lbs, 13 ounces of DME. That’s all the DME I had on hand. I estimate that this can hold a total of 4.57 lbs of DME. See the next picture for the math on that. This container is about 6 1/2″ tall without the lid. This is all the DME I had on hand. If there are 5″ of DME in the container that figures out to about .7625 lbs of DME per inch. Let’s say there is another 1″ of usable space. 3.1825 (measured weight) + .7625 (estimate for additional inch of DME) = 4.575 lbs. That gives you a spare 1/2″ to easily close the lid. This is a great container. I purchased this back in April of 2013 and as of this edit (September of 2015) it’s still working great for me and in use as my primary DME Container. This entry was posted in Containers, Featured Reviews, Grain Storage, HBF Tested, Made in the US, Reviews, Reviews & Top Posts on May 3, 2013 by admin.